Our beach town may be known as North Carolina&apos;s Small Wonder, but it&apos;s a big wonder why with this list of top things to do this summer. 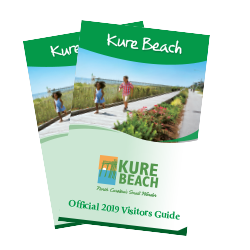 Here&apos;s our collection of can&apos;t miss activities for you and your family to enjoy on your summer vacation to Kure Beach. Spend a day seeing Lorikeets fly high and feed them from the palm of your hand then explore marine life exhibits at the North Carolina Aquarium at Fort Fisher. Cast your line from one of the oldest piers on the Atlantic Coast, the Kure Beach Fishing Pier. Head back in time and experience history with cannons and earthenworks at the Civil War&apos;s largest land-sea battle site, Fort Fisher State Historic Site. Indulge in famous Kure Beach dishes like pork chops at Freddie&apos;s Restaurant or grouper wraps at Jack Mackerel’s. Paddle a kayak from Federal Point in Kure Beach to Zeke&apos;s Island, one of the three original National Estuarine Research Reserves. Learn about the importance of saving sea turtles during Turtle Talks: Pleasure Island Sea Turtle Project every Monday at Ocean Front Park & Pavilion. See the unique coquina rocks and look for sea life that calls the eco-system home during low tide on the beach at the north end of the Fort Fisher State Recreation Area. Have a family dance party during Boogie in the Park at Ocean Front Park, every first and third Sunday, May through October. Take in a sunrise with a four-wheel drive to the South End of the island at Fort Fisher State Recreation Area. Note: vehicle permit is required. Enjoy a picnic and photo opps galore under the stately live oak trees at Fort Fisher State Historic Site. Play a round of disc golf at Joe Eakes Park and let your dog off leash at the park’s Gurney Hood Barking Lot in Kure Beach. Hike the Basin Trail out to the Fort Fisher State Recreation Area’s Observation Deck and make a stop by the Hermit Bunker. Dive to North Carolina’s First Heritage Dive Site, The Condor, a Civil War-era blockade runner shipwreck off Kure Beach.